Was Star Trek the first television series with a vegetarian character? 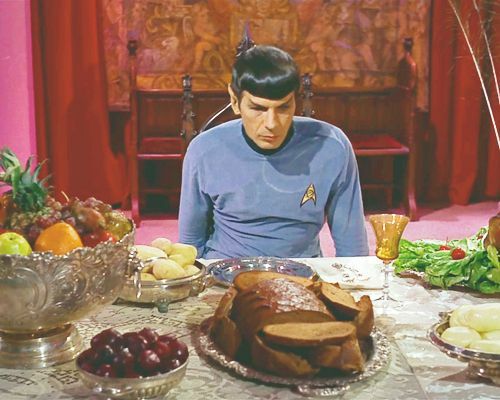 In The Original Series (1966-1969), we observe that Spock is a vegetarian. As the Star Trek universe evolved, this became a trait of Vulcans in general. I recall reading an article once that claimed that Star Trek was the first television series to feature a recurring vegetarian character. I cannot locate this article and I do not have a recollection of how reputable it was. Is this claim true? Was Star Trek the first television series to feature a recurring character who is vegetarian? No, but he was the first recurring vegetarian character in a western TV show. Vegetarians have been speaking up for animals since at least the time of Pythagoras (570-490 B.C. ), the Greek mathematician. Television sets have been around since 1923, and by 1947 were in enough American homes for Truman to deliver the first Presidential television address. But who is the first Vegetarian character on television? Who is the most recent? The Vegetarian characters in between? The answers are here. Clicking on the first link, 1951 to 1993, takes us to a list of the earliest vegetarian characters on TV. The first vegetarian character to appear on a sitcom or drama is apparently one Professor Heywood Bradford in the episode "Gracie's Vegetarian Plot" (1 or 2 August 1951) of The George Burns and Gracie Allen Show (1950-1958). Of course [crops instead of meat is] a good idea, Kimba. If all the meat-eating animals can learn to eat vegetables instead then the weaker animals will be safe, and we can all live in peace. Third on the list is our friend Mr Spock from Star Trek: The Original Series. For further reading on vegetarianism among Vulcans, see Why would Vulcans be vegetarian in an era with replicators? Not the answer you're looking for? Browse other questions tagged star-trek star-trek-tos food spock or ask your own question.